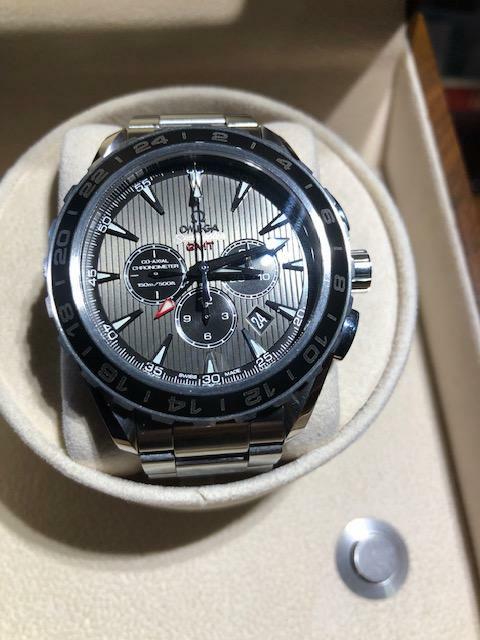 For sale: Omega Seamaster Aqua Terra 150M GMT Chronograph. This 231.10.44.52.06.001 comes with Omega box, instruction manual and card wallet and all papers.. This watch has a grey dial with vertical stripes in relief and black sub-dials. There is a date window between 4:00 and 5:00 and the dial is surrounded by a 24-hour bi-directional rotating bezel. This version has the caliber 3603 coaxial movement which is displayed via the crystal caseback. The watch currently is an excellent condition and only has a few minor scratches from use. Keeps excellent time. Quick set hour hand feature which lets you adjust the hour hand without stopping the second or minute hand. Separate "GMT" hand indicates home time. Water resistant to 150 m. Price is $3500 including 2nd day air shipping. rhardrey@consolidated.net or PM.